According to the U.S. Food and Drug Administration, watermelons are free of fat and cholesterol. They're also low in sodium and a good source of vitamin A and high in vitamin C.
Watermelon's red color is caused by lycopene, a carotenoid pigment that researchers believe is a powerful antioxidant that helps fight cancer and other diseases. 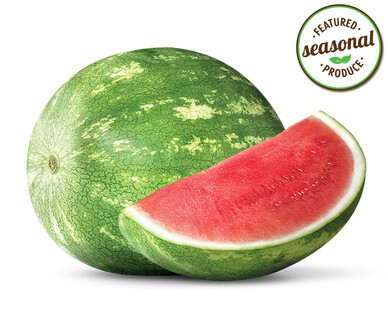 Watermelons are also a good source of vitamin A, which helps promote healthy eyes and skin. Vitamin C is another vitamin found in watermelon. The cancer-fighting antioxidant has been shown to help improve immune system health. Watermelon is high in vitamin A, which can help protect your vision and keep the eye doctor away. The vitamin C in watermelon is good for colds and your skin. Choose symmetrical watermelons with dried stems and yellowish undersides. They should be dark green in color and be relatively heavy in size.